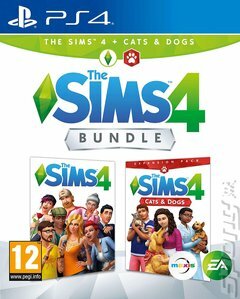 The Sims 4 Bundle: The Sims 4 + Cats &amp; Dogs contains... well, a whole load of sims and a bunch of cats and dogs! It brings together the core game and one of its most popular expansions in one nice plump box. The depth and sophistication of the sims themselves stepped up a gear in this outing for the series. For the first time, sims have persistent emotional states. This means that rather than just being happy or sad, fulfilled or unfulfilled, sims can have emotional states that run deeper. They might be depressed, vulnerable, flirtatious or angry. And there are consequences to that - a depressed sim won't feel like doing much of anything, for example. That means that the player's response has to be more sophisticated, too. The game becomes about more than just about fulfilling a sim's immediate need, and involves managing them on a longer-term basis. Then there's Cats &amp; Dogs, which deepens the pot of content even further with pets that you can create yourself to play with and round out your virtual home!